I haven’t watched The Eurovision Song Contest in years. Not, I should add, through any especial resistance, it’s just that I haven’t been in on the night, or something else has taken precedence. And, no – it’s not “I had a library book to return” – I’m really not being snide. I just haven’t watched it, OK? And then, on Saturday, I watched it. Or some of it anyway. Wow. It’s terrific! If you don’t like all the songs, fair enough. Who would? But the production, the set design, the arrangements, the lighting, the swooping camera-work, the snappy direction, the sound mix, the (usually) flawless juggling of multiple international TV feeds… This is a production of unimaginable complexity pulled off seemingly effortlessly. All of which left me with two niggling questions. And talking of X-Factor, I say put Simon Cowell in charge of finding our next Eurovision entry. I bet we’d get more than cinq measly points. 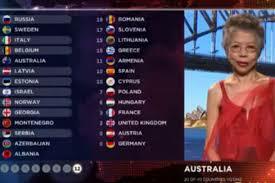 Secondly, what was with Australia’s results presenter? Into a parade of glossy lookalike 25-35 year-old sparkly, grinning, models presenting their country’s results, Australia threw a very unglossy, rather elderly newsreader, Lee Lin Chin. Was this a humorous, camp masterstroke: a bold, Aussie two-fingered salute to convention? Or was it something much more boring: another example of Australia’s collapse before an onslaught of worthiness? Did someone, somewhere decide that there are far too many curvy young women and handsome young men on Eurovision and that brave Australia will strike a blow for the rights of little old Asian ladies? In other words, was in done with an intent to embrace the spirit of Eurovision, or to undermine its supposed sexist, racist xenophobia. I do hope it’s the first. This entry was posted on May 28, 2015 at 6:32 pm and is filed under Review, Television. You can follow any responses to this entry through the RSS 2.0 feed. You can leave a response, or trackback from your own site.